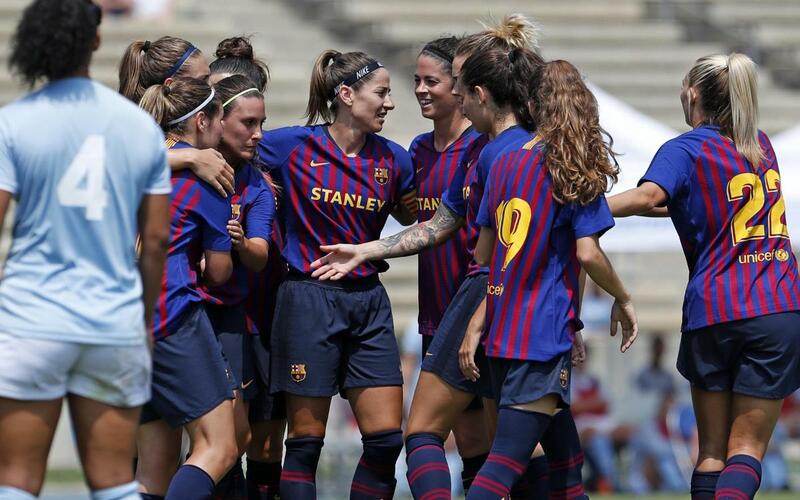 LOS ANGELES, California — Alexia Putellas opened the scoring early in the second half before Mariona Caldentey and Toni Duggan added braces, as FC Barcelona rolled to a pre-season opening 5–0 victory over SoCal FC at UCLA’s Drake Stadium. The game, which was Barça’s first match not only of the 2018-19 pre-season, was also the team’s inaugural game donning its new jersey sponsored by Stanley, which was unveiled on Friday, at a special event held at the team’s hotel in Beverly Hills. The match, which began at 10.00am PST, was a stalemate through 45 minutes. Barça, however, controlled the ball far more than SoCal — a women’s summer league team consisting mostly of college players — despite being unable to find the back of the net. But six minutes into the second half, Alexia took a pass from Duggan and finally got Barça on the board, becoming the team’s first goalscorer of the new season. SoCal, which had battled admirably to keep Barça of the board until the goal, then surrendered four more in the final 40 minutes. Mariona struck to make it 2–0 in the 63rd, and twenty minutes later Duggan chalked up Barça’s third with a clinical volley back across the goalmouth. That goal seemed to open the floodgates and in the final minutes, Mariona and Duggan each added one more goal to their tallies. The victory gives Barça a feel-good triumph in it’s only match of the 2018 summer tour, which saw it train for two days at Nike World Headquarters in Portland, Oregon before taking Los Angeles by storm.